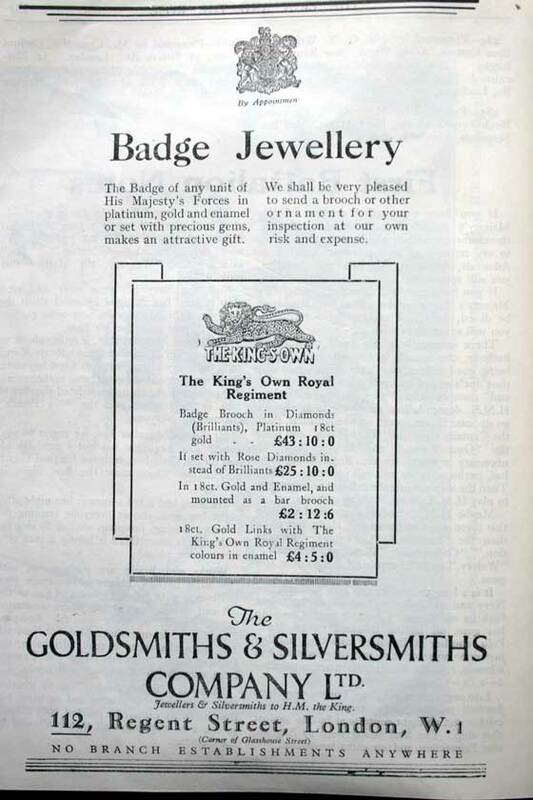 The Goldsmiths and Silversmiths Company Limited advertised in The Lion and The Rose, the Regimental Journal, in 1931. 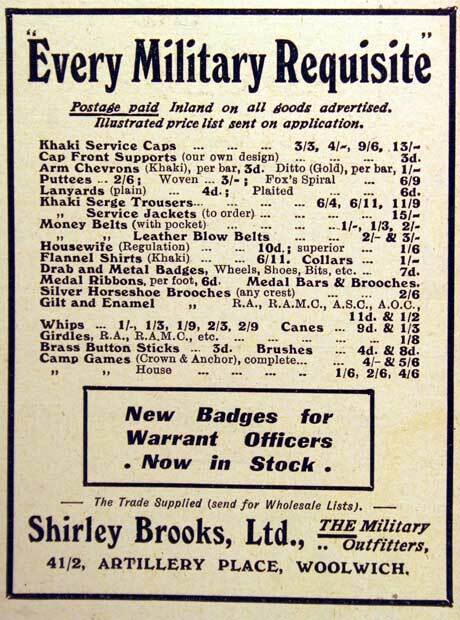 The First World War provided a big opportunity for the sale of sweetheart badges and other similar items. 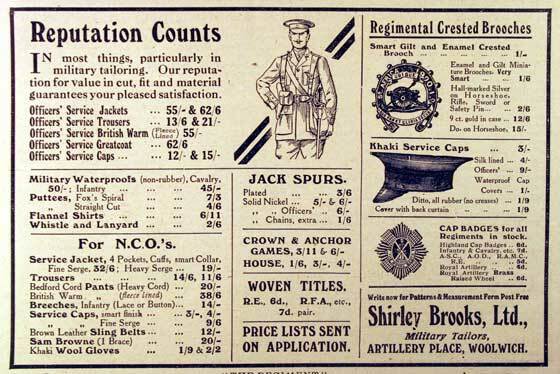 Below we present a few advertisements from the period 1915-1918 advertising the sort of things which were available. As historic adverts none of these products are available at present! Advert in 'Regiment Magazine, circa 1915-1918. 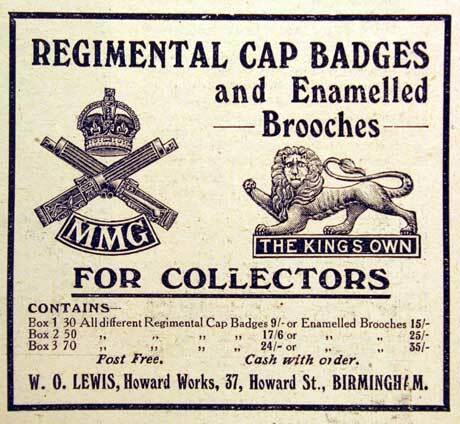 W O Lewis, Howard Works, 37 Howard Street, Birmingham: Regimental Cap Badges and Enamelled Brooches. Advert in 'Regiment Magazine, circa 1915-1918. H Samuel, 68 Market Street, Manchester: gold photo pendant; safety razor set; luminous wrist watches and more! Advert in 'Regiment Magazine, circa 1915-1918. 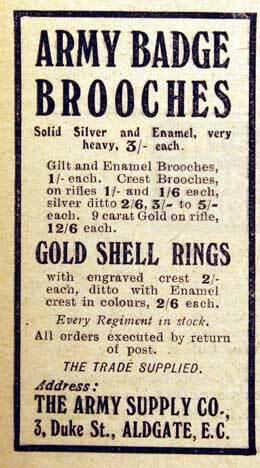 The Army Supply Co. 3 Duke Street, Aldgate, London: Army Badge Brooches and Gold Shell Rings. 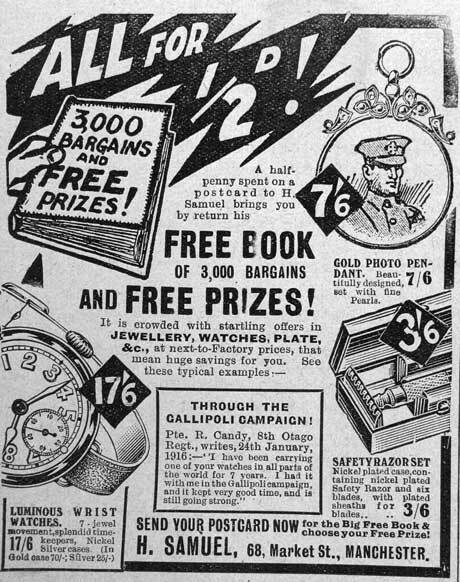 Advert in 'Regiment Magazine, circa 1915-1918. The Globe Brooch Manufacturing Company, 61 Bevington Road, Birmingham: Rifle Crest Brooch. Advert in 'Regiment Magazine, circa 1915-1918. 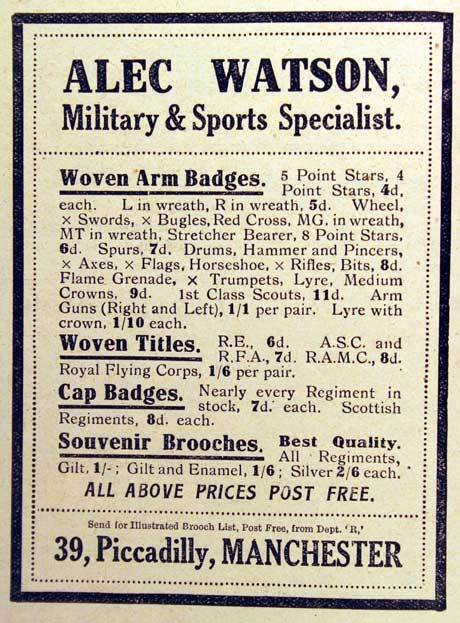 Alec Watson, 39 Piccadilly Manchester: Woven arm badges; woven titles; cap badges; souvenir brooches. Advert in 'Regiment Magazine, circa 1915-1918. Botly & Lewis, 25 King Street, Reading: Badges. Advert in 'Regiment Magazine, circa 1915-1918. 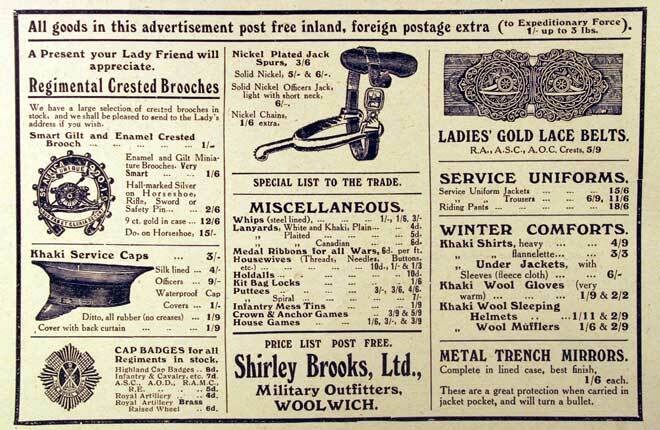 Shirley Brooks Ltd, Artillery Place Woolwich, Military Tailors. Advert in 'Regiment Magazine, circa 1915-1918. 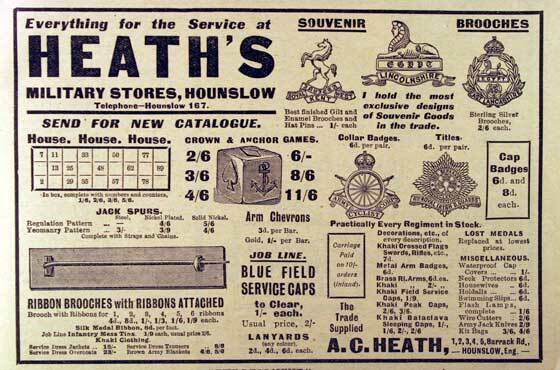 A C Heath, Barrack Road, Hounslow. Advert in 'Regiment Magazine, circa 1915-1918. 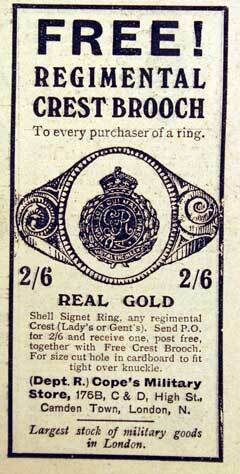 Cope's Military Store, High Street, Camden Town, London: Regimental Crest Brooch and rings. Advert in 'Regiment Magazine, circa 1915-1918. Alec Watson, 39 Piccadilly Manchester: souvenir brooches. Advert in 'Regiment Magazine, circa 1915-1918. 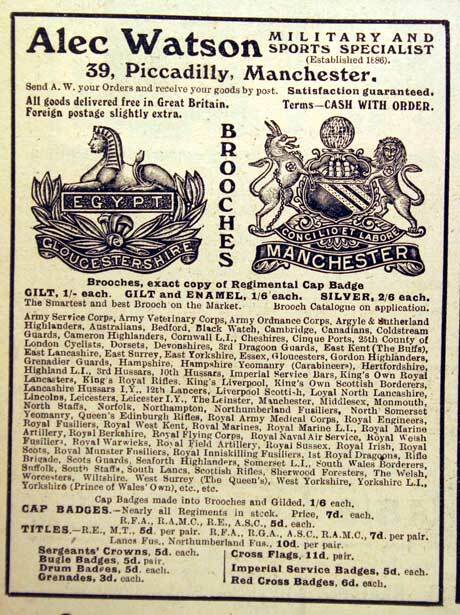 Botly & Lewis, 25 King Street, Reading: Badge Brooches of the British Army. Advert in 'Regiment Magazine, circa 1915-1918. 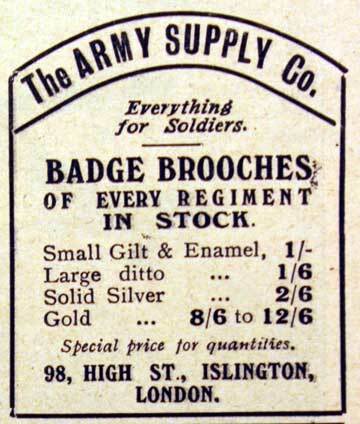 The Army Supply Company, 98 High Street, Islington, London: Badge brooches of every regiment. Advert in 'Regiment Magazine, circa 1915-1918. 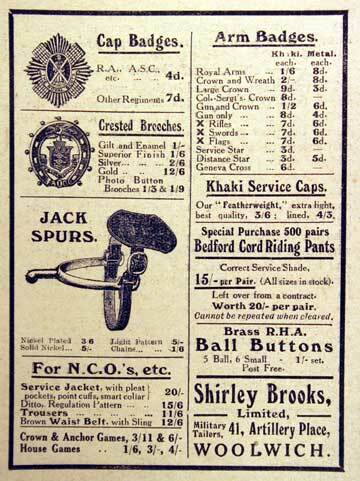 John Hyman and Co. 103 Houndsditch, London: metal arm badges; regimental cap badges and crest brooches. Advert in 'Regiment Magazine, circa 1915-1918. 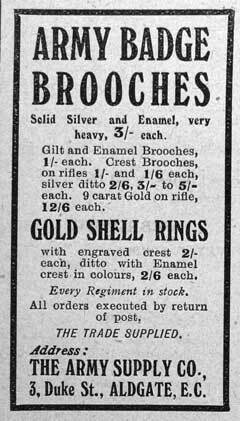 The Army Supply Company, 3 Duke Street, Aldgate: Army Badge Brooches and gold shell rings. Advert in 'Regiment Magazine, circa 1915-1918. 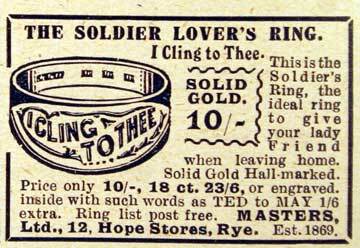 Masters Ltd, 12 Hope Stores, Rye: The Soldier Lover's Ring. Advert in 'Regiment Magazine, circa 1915-1918. George Edward Wright & Co, 9 & 11 Wilson Street, London. 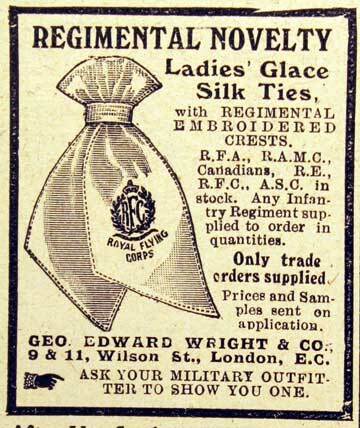 Ladies' Glace Silk Ties with regimental embroidered crests. Advert in 'Regiment Magazine, circa 1915-1918. 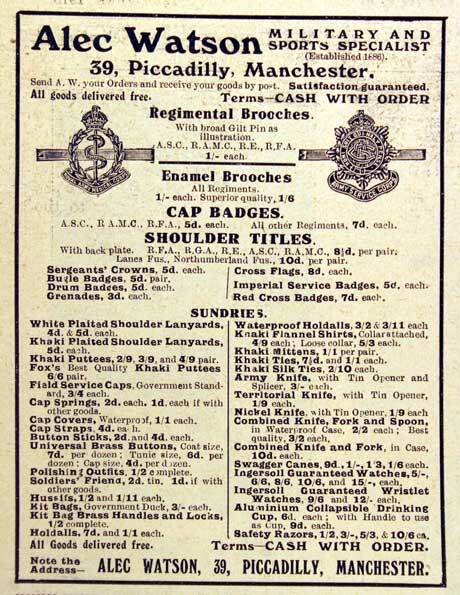 Alec Watson, 39 Piccadilly Manchester: shoulder titles; cap badges; souvenir brooches. Advert in 'Regiment Magazine, circa 1915-1918. 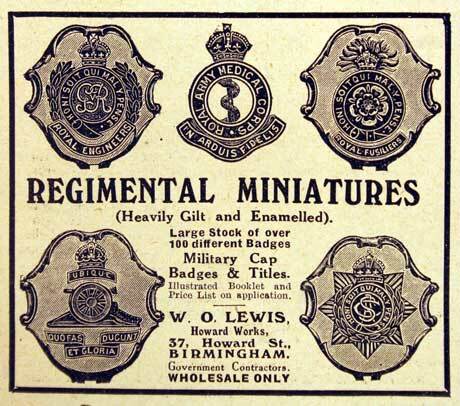 'W O Lewis, Howard Works, 37 Howard Street, Birmingham: Regimental Cap Badges and Enamelled Brooches.